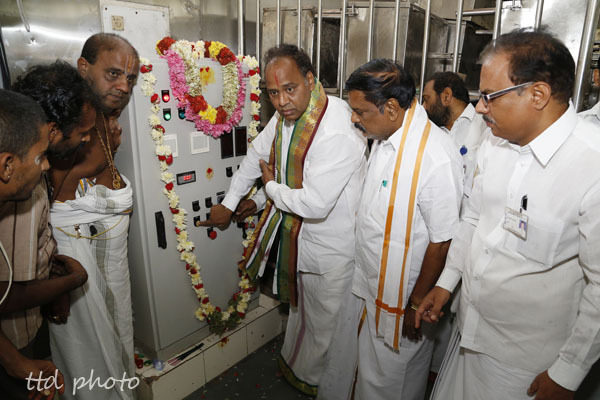 Tirumala, 20 Sep. 14 : Tirumala JEO Sri K S Sreenivasa Raju on Saturday inaugurated a new laddu-boondi conveyor system which has a capacity to transfer over five lakh laddus per day. 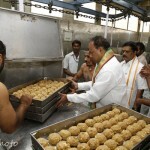 After performing puja to the new conveyor system installed at Boondi Potu in Tirumala, the JEO told media persons that previously two conveyor systems were in use with one for conveying laddu alone while another for conveying both boondi and laddu and these were installed in the year 2007 and 2010 respectively. “But when some problem arises in laddu-boondi conveyor system, the another one which is meant only for conveying laddu alone cannot be utilized for transferring boondi. 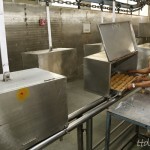 To overcome this problem, the old laddu conveyor was replaced by laddu-boondi conveyor system today for the purpose of transferring both laddu and boondi”, JEO added. Elaborating further, the JEO said, the new year system worth about Rs.45lakhs was installed by The India Cements Limited from Chilamkur of Kadapa district and the installation work was completed within a month’s duration. 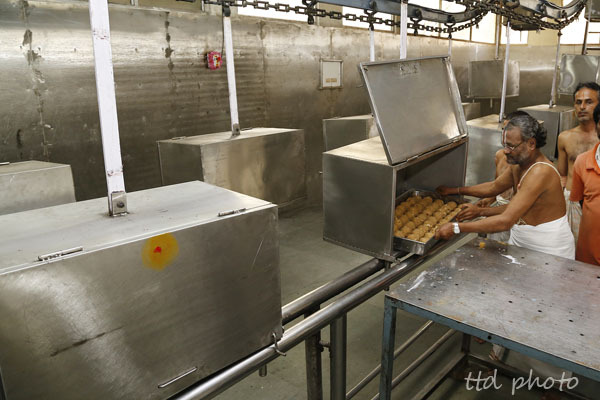 Now with two laddu-boondi conveyor systems working, we have the capacity to transfer upto eight lakh laddus every day”, he added. Temple Deputy EO Sri C Ramana, EE Water Works Sri Narasimha Murthy, AEO Potu Sri Kesava Raju, Deputy EE Sri Rajasekhar, AVSO temple Sri Sai Giridhar and others were also present.